We are garden fairies and we are not tattle tales but we feel that certain events here need to brought to the forefront so they can be explained. First and foremost at the forefront of our minds is how a certain group of garden fairies, who shall not be named because they are tree fairies, had a big ol' time a few weeks ago. Now, we do not know what went on but we know that the end result is that the Ginkgo tree lost most of its leaves while they were still green. We are garden fairies and we know this is oh-so-wrong. Everyone knows Ginkgo tree leaves all turn yellow and then Swoop! In one big swish, all those yellow leaves fall to the ground. Got that tree fairies? We know you read this stuff. Listen up. The Ginkgo leaves need to be turned yellow before you cut them all loose all at once from the tree. We are garden fairies and we hoped this turn of events, or shall we say non-turning of leaves, does not in anyway detract from the beauty of fall in the garden. We humbly apologize if it does. But we don't think it does! We think this was a fluke, but to be on the safe side we plan to be more careful and watchful so that this does not happen with other leaves that we are supposed to turn a color, other than green, before we release them from the trees. Already, we are seeing marvelous color on the red maples, which we would be delighted to show you, except Carol hasn't take any pictures of them yet. Maybe she will this weekend. Violet Sweetpea Maydreams, who is in no way going to take responsibility for all the leaf color changes in the fall. Yikes, no yellow? What is next? Sugar Maples stay green? Oaks with no acorns? What naughty fairies! Gorgeous golden Gingko leaves (say that five times fast) are one of the many highlights of fall. The gardener should keep an eye on things with such mischievous hijinks occurring! 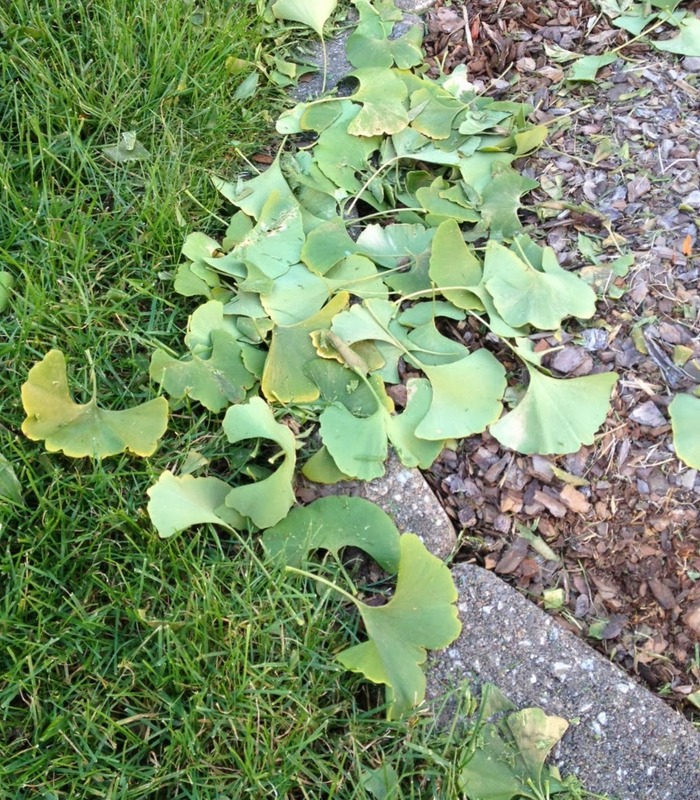 Please keep your fairies away from my Gingko! 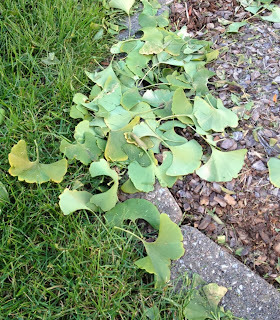 Fall without yellow ginkgo leaves... they truly are naughty! Thanks for doing the great giveaway. My new Rebecca Sweet book arrives today.